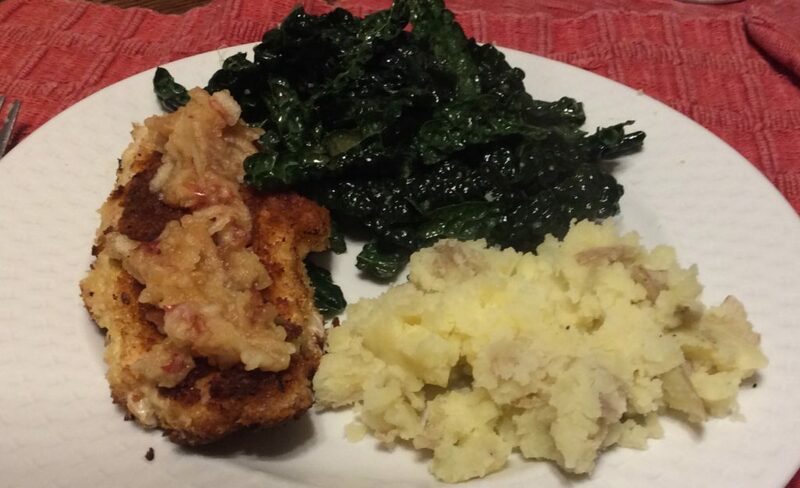 I got this meal kit for to make for Crispy Chicken Schnitzel with Mashed Potatoes & Creamy Mustard-Dressed Kale for my non-vegan daughter and me, but I ended up eating it mostly by myself: my daughter ended up with other plans. No matter, I saved the chicken breast for her for tomorrow and I’ll make her some fresh mashed potatoes with potatoes I had at home. This is a meal that is more like disparate components than one full meal. The components all work with each other, don’t get me wrong, but you could substitute any of them for something else and the meal would still work. I’m not sure if that’s good or bad. The chicken schnitzel itself was good – but it wasn’t really a schnitzel. The breast pieces were skinless and boneless but they had not been flattened – nor were there any instructions to flatten them. Moreover the cooking times given were for a thick piece of breast. The chicken was fine, but it would have likely been juicier and more enjoyable if it’d been flattened first. The flavor was OK, but not extraordinary given that there was no seasoning beyond salt on the breading. Commenters suggest adding onion and garlic powder to the flour, I’d also add dried oregano or fresh chopped parsley to the egg. UPDATE: It turns out that the schnitzel part was my fault. 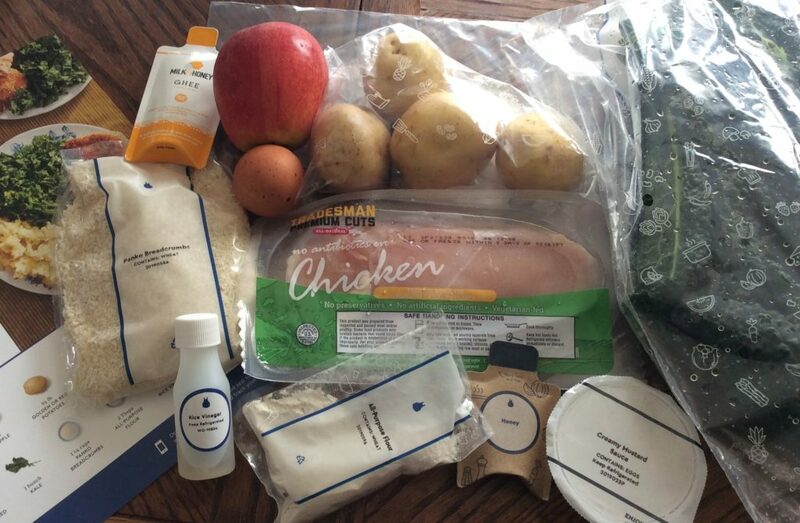 Blue Apron had sent me boneless chicken thighs for this recipe, and the chicken breasts for another one. I didn’t look closely and just assumed both were chicken breasts and ended up using the wrong cut. The apple slaw that accompanied the chicken was also good, but it didn’t really improve the chicken substantially. I also ended up with way too much slaw. The mashed potatoes, which are simply mixed with olive oil and salt, were below average. The olive oil flavor was too strong. My vegan daughter didn’t like them. Personally, I think the recipe should have had you mix half the ghee with olive oil to fry the schnitzel, and use the rest of the ghee with the mashed potatoes. Commenters also suggest adding a couple of crushed garlic cloves to the potatoes. The real star of the meal was the kale, however. It was dressed with a “creamy mustard dressing” which is just Dijon mustard and mayo, mixed with honey and salt. It was delicious – I don’t even like kale but I ate the whole thing (my daughter didn’t want to even try it, and I figured it’ll be soggy tomorrow). I’ll definitely try this dressing on other stuff (recipe below). All the ingredients for this kit were there and they were fresh. I love that Blue Apron includes ghee for cooking rather than relying of you having butter at home (as HelloFresh does). 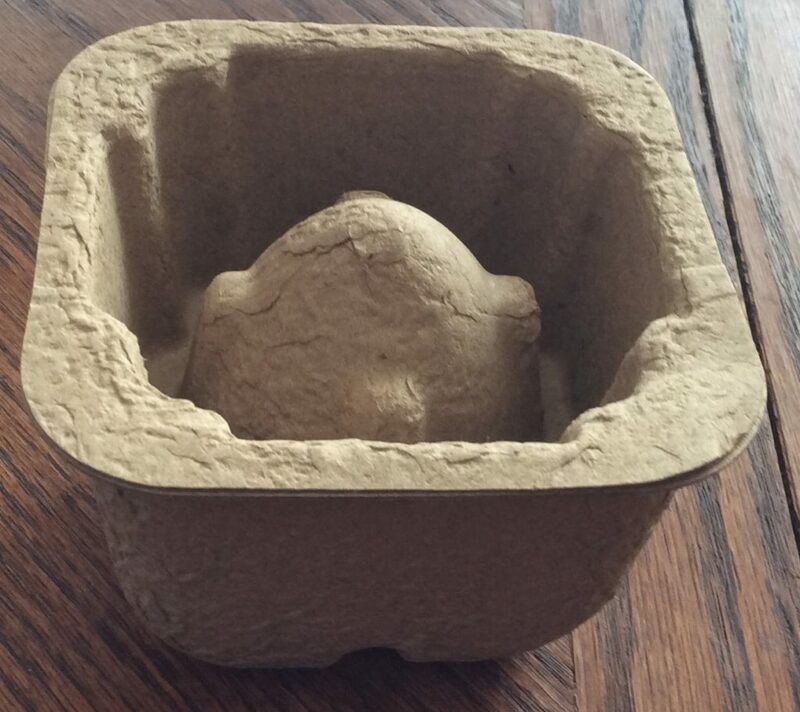 And I also loved the container for the egg. The only mild inconveniences is that it’s winter, and I don’t keep my house particularly warm, so the honey was crystalized by the time I went to use it. The ghee was also pretty hard. Don’t refrigerate either when you get them – at least in winter. The meal was all in all satisfying – though I did eat all the kale by myself. It was also relatively quick and easy to prepare. And it’s also easy to recreate at home with your own ingredients. If using Kale, remove central stem from kale leaves, then cut into strips. in a medium bowl, whisk together the mayo, honey and mustard. Season. Add kale and mix well, using your hands to make sure all the leaves are coated.